Spiritual Direction Do you desire to grow in your relationship with God and become more aware of God in your daily life? Perhaps God is inviting you to seek spiritual direction. Your desire to deepen your relationship with God grows as you discover God's abiding love and care for you. Several spiritual directors are available. Call (701)255-1520 for more information about spiritual direction. Renew Your Inner Spirit at Our Hospitality Center - The monastery is a perfect place for quiet time to relax, read and pray in a restful setting. It is a place for: individual and/or directed retreat, for self-directed renewal times, for days or times of solitude in private, for spiritual direction. Private Retreat: Gift yourself with quiet time to nurture your inner self and your relationship with God and others. A private room will be provided where you can retreat into your own space to hear God within, or enjoy the beauty of nature. Stroll the beautiful walking paths and experience a prayerful labyrinth walk. Come and let monastic quiet wash over you and refresh you. You may pray with the sisters of you desire. Meals provided. Length of time is flexible. Directed Retreat: In a directed retreat, the participant meets daily with a certified spiritual director who supports them and offers suggestions to enhance one's relationship with God, especially in prayer and life events. Please call 701-255-1520 for more information and to determine date(s) of retreat. Group Retreat or Reflection - Arrange a time for reflection, prayer and/or retreat for your group. Bring your own leader or inquire if someone from the Center could facilitate the retreat. Facilities and lunch are available. Call (701)255-1520 make arrangements. Outreach Programs - Speakers from the monastery are available to present programs in your locality. Call (701)255-1520 for information. 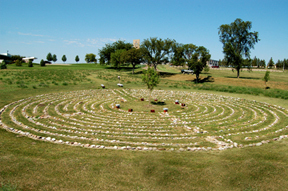 Labyrinth Prayer Path Walk - Experience our beautiful scenery and prayerfully walk our outdoor labyrinth on your own. Are you pondering your relationship with God, self, others? Perhaps walking the labyrinth will refresh your spirit and you might find some of the answers you are looking for. Preregistration is not required as you are welcome to walk our labyrinth any time between 8 a.m. and 8 p.m. Call (701)255-1520 to arrange date(s) and time(s) that suit your needs and for further information. © 2012 Benedictine Sisters of the Annunciation, B.M.V.